. . . A few centuries ago, war did not operate in the way you describe. A large agricultural population was essential; and war destroyed types which were then still useful. But every advance in industry and agriculture reduces the number of work-people who are required. A large, unintelligent population is now becoming a dead-weight. The real importance of scientific war is that scientists have to be reserved. It was not the great technocrats of Koenigsberg or Moscow who supplied the casualties in the siege of Stalingrad: it was superstitious Bavarian peasants and low-grade Russian agricultural workers. The effect of modern war is to eliminate retrogressive types, while sparing the technocracy and increasing its hold upon public affairs. In the new age, what has hitherto been merely the intellectual nucleus of the race is to become, by gradual stages, the race itself. . . . The human race is to become all Technocracy’ (pgs. 255-6). War is indeed one method of the technocrats to cull the ‘dead-weight’, as they see it, from mankind. And now Mike Adams has revealed another, subtler, method: poisoning the food supply. As you can see from these examples, food has become a weapon against humanity. It is the new vector for a stealth world war against humankind -- a war which is being quietly waged right this very moment with weapons you would probably find in your own pantry. And Dr Farrell adds to this discussion the findings of a recent scientific study of genetically-engineered food: mainly, that the unnatural DNA fragments in said ‘food’ likely enter the bloodstream of the people who eat it, resulting in harmful changes to their own DNA. Sound too grim to be true? Let's look at some solutions on the positive side. The way out of all this is to grow your own food or at least buy as much as you can from local farmers and CSAs. Any food acquired through mainstream corporate sources is likely to be intentionally engineered, laced and packaged with incredibly toxic poisons ranging from heavy metals to hormone disrupting packaging containers. But food grown by honest farmers provides genuine nourishment, not death. Lewis, C. S. That Hideous Strength: A Modern Fairy-Tale for Grown-Ups. New York: Scribner, 2003 . At the same time, if this devolution of power is successful in California, it could help build momentum for a similar movement in the Union as a whole, thus weakening the influence of powerful States and regions over weaker ones. As we work our way toward having a Christian king and father at some level (national, regional, state, or local) with whatever other arrangements surrounding him (elected bodies of advisors and so forth), we could for a time return to a system akin to that under the Articles of Confederation, where the States were more like equal brothers rather than the current system of national political party warfare that dissolves old, venerable distinctions and sets every man’s hand against another’s. But let it be said: Paper constitutions are not the divine gifts many people make them out to be; they are certainly not the highest development of political thought. More often than not, they are merely a tool that the powerful and wealthy use to exploit their fellow countrymen. We agree more with J. R. R. Tolkien than with the ‘demigods of Philadelphia’ - the best form of government is an ‘unconstitutional monarchy’ that grows naturally out of, enfleshes, and protects the traditions of a folk. 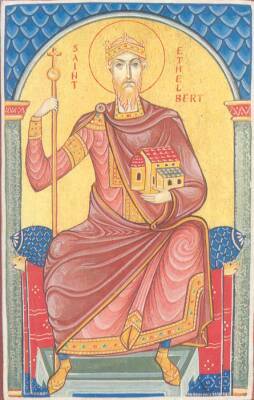 When the might of Rome had departed from the British shores, and barbarian tribes fell upon them, Gregory, the boast of Orthodox hierarchs, sent new apostles to enlighten them; and the servants of God, coming to land on Thanet's coast, met the glorious King Ethelbert, whom they brought to faith in the one true God. Having learned of the Christian Church from the holy Bertha his queen, and in her piety and kindness perceived the essence of the Orthodox Faith, Ethelbert received the new apostles with reverence and opened his heart to their preaching; wherefore, his sins were washed clean away in the hallowed waters of regeneration. Remember now, ye Christians of the English land, the holy Ethelbert, your father in the faith, for by his corrections ye came to know eternal life, to understand the Truth, and to submit to the great Father of spirits; wherefore, in acclamations exalt him most fervently, for he reigneth ever with Christ and intercedeth for us all. Having acquired all the Christian virtues, O right-believing King Ethelbert, thou didst attain glory in doing godly deeds, and art now enrolled among the choirs of the saints on high; for, having passed from the things of this fleeting world, in glory thou reignest now eternally with Christ our God, Whom do thou beseech to grant us great mercy. For a short life of the saint, see the entry of 24 February at http://www.abbamoses.com/months/february.html. To Holy St Ethelbert let us lift up prayers on behalf of his wayward children in the Faith and in the flesh here in the South. Some like Father Matthew Raphael Johnson (who is now writing for Eurasia Review http://www.eurasiareview.com/author/matthew-raphael-johnson/), believe Russia should challenge the West’s moves in the Ukraine, which is Russia’s very own borderland. The Ukraine issue has been extremely upset. 1. Who riots over abstract issues like joining the EU? Its always something more concrete. Western ideas destroyed the economy. The EU is drowning in debt while Belarus and Russia have budget surpluses and trade surpluses. I don't get it. 2. Originally, as was the case in 2004, the pro-Russian rallies are 10-20 times larger than the anti-Russian. Soon, the pro-Russian rallies are not covered, and the anti-Russian protests grow. In Syria the same: The pro-Assad rallies were massive and dwarfed the anti-Assad protests. 3. Consistently, over the last 10 years, the percentage of pro-western Ukrainians is about 2-3%. I've read polls in Ukrainian, Russian, Polish and English. The same numbers apply. It was western market absurdity that destroyed the economy in the first place. Now, they're rioting because they are not given more "market freedoms." 4. Consistently, Ukrainians support a closer union with Russia about at a level of 75-80%. They still want independence, but also want a fraternal connection between the two countries. 5. 20 policemen have been killed. Rioters are armed with grenades and machine guns. Yet, no cop has fired back. Explanation? I have none. 6. When the Germans invaded the USSR in 1941, they destroyed about 40% of the economy. From 1990-1994, 80% of the Russo-Ukrainian economy was dismantled. Yet, allegedly, the rioters want closer ties with the west? My view has become extreme. Russia needs to invade Ukraine and see what the US does. Parts of Galicia and Volyn should be given independence. The US is overstretched militarily and totally broke. The Shanghai Cooperation Organization is led by Russia and China and is aimed at the US. China has promised to back all Russian claims against the west, so Russia can help but win, since US bonds are being bought by the Chinese. The color revolution issue is the most disturbing political development in history. These are well orchestrated coups. They have the identical script without the slightest deviation. All major media say the exact same thing, using the same words and phrases over and over again. And in every single case, the country is left worse off than before, with the only difference being that there is no longer any government to keep US capital out. Yet all major political analysts and professors repeat the same slogans over and over, and continue to collect 6 and 7 figure salaries. The evil has become so blatant that the system does not even try to be creative about it. The same slogans are recycled over and over, and no one notices. Can it really be this bad, or is the media so completely controlled that reporters, analysts, etc., don't know any better? I've been following Ukrainian politics since 1990. I have not been this upset over anything in that time. It affects all of us. If they can get away with this kind of coup there, why not here? Protesters are not in short supply anywhere. It proves what I've been saying: the econ. downturn only benefits the Regime, since they control the direction of protests. The whole thing is laughable. Pro-western opinion in Ukraine has been consistently between 3-7%, depending on the poll. The west is blamed, rightly, for the disintegration of the economy since 1991. Attitudes toward Russia hover around 75% approval, with maybe 60% in western Ukraine (especially in the cities). The Ukrainian division is not east v west, but it is urban v rural. Urban areas are pro-Russian, while the countryside is mixed. I've always been interested in police responses to these types of things. Riot suppression is a focus of the national police units of South Korea and Northern Ireland. The unspoken contract is that, if protesters use non-lethal weapons, the response will be moderate. In Ukraine, they were shooting (etc), and the police would not fire back. This cries out for explanation. No other society would tolerate this. The police abandoned their posts on Saturday, which is rational if they are getting no state support. There was a time when these groups, such as the OUN, were positive. They were a militant underground against the USSR. The problem was that these are mostly uniat organizations. Bandera himself was UAOC, as far as I know, but Melnyk and so many others were uniat. I've read OUN writings since their founding. They want full independence against any and all. The EU would be heresy to them; as would free trade and economic hierarchy. So if that is the core of the movement, they have fallen from their founding documents. I've read that the Progressive Socialist Party of Ukraine (that of Natalie Vertrenko), a Eurasian group I normally respect, said that the uniats were the essential part of the movement and had not the slightest interest in the EU. I'm willing to accept that for now. My opinion has been that Russia needs to invade and occupy most of Ukraine and the Crimea. Also, absorb Carpatho-Rus, very pro-Moscow. If Galicia and Volyn want to go, let them go (though the urban populations will not like that). The funny thing is that I still believe in Ukrainian independence, but entering the EU is its negation. the UAOC under Met. Mefodii (whose group my own takes its canonical line, as do two RTOC groups in Moscow) is anti EU and quite opposed to the protests. The first thing the well paid protesters did is pardon Julia Tymoshenko, the head of the oligarchical faction in the energy industry. One of the most unpopular women in Ukraine, she made her billions siphoning off Russian gas and selling it at an inflated rate on the side. Everyone knows she is a fraud. This alone shows what the "protesters" were all about. The simple reality is that nearly all Ukrainians belive that western "assistance" is what brought down the economy. This is why the uniat movement is significant, since they are anti-Russian on religious grounds. Perhaps it is time someone challenged them, for as Kurt Nimmo points out in his news article, this Western-backed series of ‘regime changes’ shows no signs of slowing down. But no benefits accrue to the peoples of the countries thus affected; they simply become slaves to Western banks and corporations who move in after the chaos to take advantage of the situation (to echo Fr Matthew’s points above). Back in 2011 the Party of Regions warned that if left unchecked the globalist financier George Soros would unleash a “Libyan scenario” on Ukraine. “I even have information that Soros has allocated certain funds in order to prepare a certain group of young boys here in Ukraine who could launch any existing projects based on the North Africa examples,” said Aleksandr Yefremov, head of the Party of Regions parliamentary faction. A “certain group of young boys,” namely violent gun-toting hooligans from the Right Sector and associated neofascist groups, are reportedly in control of Kyiv as of Saturday. Members of 31st Hundred, an opposition group from Lviv, were said to be in control of Ukraine’s Parliament building, The New York Times reports, and the president, Viktor Yanukovych, has fled the capitol. Protesters have taken control of his home. The United States and NATO supported mercenaries in Libya who overthrew the government and murdered its leader, Col. Muammar al-Gaddafi. Libya is now paralyzed by factional, regional, tribal and ideological divisions, a fate Ukraine now confronts as stores are looted, cash machines emptied, and a mass exodus departs the capitol for Odessa, Simferopol and Kharkov, Ukrainian cities largely loyal to the government and less affected by the turmoil, according to Russia Today. In 2008 the now imprisoned former prime minister, Yulia Timoshenko, talked about the role George Soros played in Ukrainian politics and the advice he gave following the financial crisis. In January we reported on the cynical attempt by Soros to undermine Ukraine and other nations in the Russian Federation. Soros’ Open Society Institute, now known as Open Society Foundations (OSF), doles out grants to activist NGOs in central Europe and builds upon and continues the work of the Ford Foundation. Since the early 1950s, the CIA has used the Ford Foundation as a funding cover. Soros and a handful of U.S. organizations such as the National Endowment for Democracy destabilize and overthrow governments, tasks formerly accomplished by the CIA. The destabilization of the Ukrainian government is part of an ongoing geostrategic move by the globalists to undermine any challenge to their hegemonic designs. Libya suffered the result of what is essentially an order out of chaos plan. A similar plan on Russia’s frontier is now underway. Unless you are seeking out meat that is certified organic, certified antibiotic- and hormone-free or raised by a local farmer you know and trust, chances are very good that you are eating plenty of pharmaceutical drugs with your cheeseburger. The Best Form of Government? Such questions are often difficult to answer in the abstract. Thankfully there are centuries of histories, West and East, to look into to help us answer. Now an ardent monarchist, in 1905 Tikhomirov wrote a massive four-volume masterpiece that became the literary guide to Russian monarchists for years to come entitled, “On Monarchist Statehood”. In it he defended traditional authority as an absolutely essential part of any well ordered society in order to maintain that balance he spoke often of, but realizing that as the best “constitutions” (for lack of a better word) grow up naturally, also admitted that such a traditional authority would not be identical for every people in the world. In this work he wrote, “If a powerful moral ideal exists in a society, an ideal calling all to voluntary obedience to, and service of, one another, then it brings about monarchy because the existence of this ideal negates the need for physical force (democracy) or the rule of an elite (aristocracy). All that is necessary is the continual expression of this moral ideal. The most capable vehicle for this expression is one individual placed in a position of complete independence from all external political forces”. In very truth, this is what the ‘moral ideal’ of the Southern patriarchy, illustrated so poignantly and brilliantly in her chief men - Washington, Stuart, Jackson, Lee, Taylor, Calhoun, and others, was and is reaching for: not the conflicting egos and the corruption and chaos of feudal and modern Europe, but the beauty of order and peace and harmony that comes from having a father, a king, a papa over the whole family of the South. Thus is also fulfilled what the Southern historian and literary critic Professor M. E. Bradford rightly termed, by way of Michael Oakeshott, the nomocratic government of the South: a government that embodies and defends the way of life of its people rather than imposes one on them (i.e., teleocratic government). Only with a father lovingly watching over all will every member of the family (and their various institutions and associations) have the elbow-room to be able to grow and develop in his (and their) proper way. So let us read some of the burning truths of kingship Mr Tikhomirov uncovered through his trials and reflections. The South and all the Western World, bewitched at present by the spell of representative government, are greatly in need of them. These appear in an essay written in honor of Tsar Alexander III of Russia after his death. The arrival of a great man was needed to show the true meaning of an eternal principle. This was done by our unforgettable Ruler, who showed the whole world that now as in the days of old, without any turn backwards, without any “reaction” or violation of “modern” requirements whatsoever, an autocrat is possible, and that now, as always, the autocrat represents a higher form of authority, the most wise and comprehensible to the hearts of Christian peoples. We should understand all the value of this instruction. Alexander III not only gave thirteen years of prosperity to his people. He demonstrated not only that we have the highest form of supreme authority; he made something incomparably greater understood, and not only to us alone, but to the whole world. The fact of the matter is that forgetting the meaning of monarchy has made it impossible for the restless peoples of Europe. And its impossibility precisely now, namely in contemporary conditions, threatens the nations with the downfall of European culture and their own disintegration. Indeed, if monarchy is impossible, if higher authority standing outside and above that of the people is impossible, then the drive to such an arrangement of society where democracy would be possible is unavoidable. Everywhere efforts are directed toward this objective. But according to natural conditions, the people, the nation, is not uniform; it is a complex whole composed of various layers, of a multitude of groups. All of this variety and stratification are unavoidable and necessary for life, and the higher the culture, the more defined and exclusive they become, the more capable they are of entering into struggle with one another. Yet they cannot live at odds with each other. They need national unification in something singular above this conflict and equally attentive [to?-W.G.] all interests. Popular rule tries unifying the country in parliaments – a sorry attempt that quickly suffers collapse. Instead of unity, it has transferred over to a concentration of power all the hostility and struggles there are in a nation, and the better the idea of representation is realized, the more that shameful scenes of wheel-dealing carry over to the center of power. The more interests are represented in parliament, the more disunity appears in authority itself, the meaning of which is only in unification. Yes, of course, unity would then come. But then also would come cultural death. This danger is already recognized, but the West sees no other path and with feverish haste rushes to direct all its “progress” and all its reforms where the final end awaits them. There amongst such deplorable work of self-destruction, the world saw before itself Alexander III, and with him the meaning of his ideal realized. How much confusion falls away with one look at this grand reign! How many forgotten truths it reveals! Monarchy is not dictatorship, not simple absolutism. Dictatorship is the personified fulfillment of the people’s imminent will, and absolutism is its negation. Monarchy – in its autocratic ideal – can sometimes do that which dictatorship does, and can, if necessary, act by rejecting popular will. But in itself it stands higher than whatever will of the people there might be. Monarchy is the idea of subordination of interests and desires to higher truth. In monarchy the nation seeks sanctification of all the manifestations of its complex life through subordination to the truth. Personal authority is needed for this, as only a man has a conscience, and only a man answers before God. Unlimited authority is needed, for any restriction on the power of the Tsar by people would free him from answering to his conscience and to God. Surrounded by restrictions, he would already be subject not to truth, but certain interests, one or another earthly power. However, the unlimited and individual nature of decision are not the essence of monarchy, but only a necessary condition so that all social interests, their conflicts and their struggles, may be brought to agreement before an authority of the same truth that is above them all. This is why the bearer of the ideal came into the world, according to the conviction expressed by all the world in recent days, as a Tsar of truth and peace. He should have been namely such, for the essence of monarchy is in the reconciling power of higher truth. The monarch does not break the social structure of life; he neither destroys any differences created by its diversity, nor does he dismantle the great or the small, but everything he directs so that the development of all classes, all groups and all institutions in no way violates truth. And thereby he gives the nation that unity which was vainly sought in “representation” and now is to be achieved in suicidal equalization. The monarch does not destroy self-initiative, advice, the work of popular thought, and he doesn’t negate the popular will when it exists. He is higher than all this. He is given not for destruction, but for direction. For him there is neither the wise man nor the fool, neither the strong nor the powerless, neither the majority nor the minority. For him there is only conscience and truth. He should see everything, but will support only that in which there is truth. Emperor Alexander III showed that monarchy in its true essence is not anything transitional, obsolete or compatible only with one phase of cultural development, but is an eternal principle, always possible, always necessary, and the highest of all political principles. If at any time this principle becomes impossible for some nation, then it is not because of the condition of its culture, but because of the moral degeneration of the nation itself. Where people want to live according to truth, autocracy is necessary and always possible under any degree of culture. Being the authority of truth, monarchy is impossible without religion. Outside of religion, personal authority gives only dictatorship or absolutism, but not monarchy. Only as the instrument of God’s will does the autocrat possess his personal and unlimited authority. Religion in monarchy is needed not only for the people. The people should believe in God so they may desire to subject themselves to truth – yet the autocrat needs faith all the more so, for in matters of state power, he is the intermediary between God and the people. The autocrat is limited neither by human authority nor popular will, but he does not have his will and his desires. His autocracy is not a privilege, but a simple concentration of human authority, and it is a grave struggle, a great service, the height of human selflessness and a cross, not a pleasure. Therefore monarchy receives its full meaning only in heredity. There is no future autocrat if there is no will, no wish to choose between the lot of the Tsar and the plough-man, but it is already appointed him to deny himself and assume the cross of authority. Not according to desire or the calling of one’s capabilities, but according to God’s purpose does he stand at his post. And he should not ask himself whether he has the strength, but rather he should only believe that if God chose him, the hesitations of man have no place. It is in the greatness of subordination to the will of God that sanctification of our political life is given in the ideal of monarchy. A fairly good documentary on the highs and lows, history and culture of the Southerners who call the Appalachian Mountains home, particularly as these are expressed in their music and related folkways. Some of the ballads are truly soul-haunting. Will pass beyond the Russian border. -From ‘To the Slavs’, version read 12 May 1867, Poems and Political Letters, p. 148. And always nearer him will draw. -From ‘To the Slavs’, version read 21 May 1867, Poems and Political Letters, p. 149. It is clear that in 2014 we are facing a turning point on the road of world history. On the one hand, we have the four nations of the newly-formed Eurasian Union (The Russian Federation, Kazakhstan, Belarus and Armenia) with its originally Orthodox Christian unity in diversity basis and ideal of symphony of Church and State, which is in the forefront of the Spiritual Resistance Movement; on the other hand, we have the anti-Christian US/EU, much imitated by the rest of the world, largely made up of former EU and present-day US colonies, although several decades behind their colonial masters. Therefore, there are today only two choices. What is uncertain is whether this is the end or just the last shock before restoration of the Orthosphere and Orthodox government which is the only thing that now stands between Christ and Antichrist, between the Orthodox Church and her faithful and the militantly atheist Western world. Time will show which way we are going to go. The way is clear. Let us manfully pursue it. Tyutchev, Fyodor I. Poems and Political Letters of F. I. Tyutchev. Trans. Jesse Zeldin. Knoxville, Tn. : U. of Tenn. Press, 1973. Just as the Confederate Greys were unsuccessful in their war against the invading Yankees in the War of Northern Revolution, so Russia’s White Army (those who defended the centuries-old Russian way of life embodied in the Orthodox Christian Faith, the Tsar, and the fatherland) was unable to physically defeat the Soviets on the field of battle during the Russian Revolution of 1917. But as Allen Tate, Ivan Ilyin, and others have pointed out, the earthly plane is not the only one on which the battle is carried out. The battle for Russia continued throughout the 20th century on the spiritual plane, and the same is true of the South since the surrender at Appomattox in April 1865. First, we shall establish that the entire struggle of Russian patriots, both military and civilian, who attempted to prevent Russia’s defeat in the Great War and her complete decomposition in the Revolution, who attempted by armed force to overturn the power of internationalist adventurers, did not reach its direct goal. The war prematurely ended with the opening of the front, and the Revolution flooded into the entire country and sank, both in quality and intensity, to the very bottom. All of Russian culture, all Russian people, and all the land were made to stand face to face with revolutionary possession: with the blasphemy of the godless, the assault of bandits, the shamelessness of the madman, the attempts at murder. All of us had to look into the eyes of Satan, tempting us with his latest seductions and frightening us with his newest terrors. Behind the entire external appearance of the Revolution- from documentation to execution, from the ration to the tribunal, from round-up to exile and emigration, from torture by hunger, cold, degradation and fear to stolen wealth and pretension to world power – behind all this is concealed the Revolution’s single and central reason, in relation to which all of these phenomena are but changing forms, a shell, the outer shape of things. This reason is given through the words spiritual seduction and religious inquiry. The secret and deepest meaning of the Revolution is held in the fact that it is most of all a great spiritual seduction; a harsh, cruel test; it burns through souls and tempers them by fiery trial. This test posed to every Russian soul the same direct question: Who are you? By what do you live? What do you serve? What do you love? Do you love that which you “love”? Where is the center of your life? And are you devoted to it, and are you loyal to it? The hour has struck. There are no more delays and there’s nowhere to hide. And there are not many paths before you- only two: to God or against God. . . .
And if you are against God, then you’ll be left to live. They won’t take everything from you, and they’ll make you serve the His enemies. They’ll feed you, indulge you and reward you; they’ll let you harm others, torment them and take away their property; they’ll give you power, profit and all the appearance of disgraceful esteem. And if you are for God and choose the path to God, then your property will be seized, and your wife and children will be disinherited. And you will be wearied with deprivations, humiliations, darkness, interrogations and terror; you’ll see how your mother and father, your wife and children slowly, like a candle, melt away in hunger and disease- and you can’t help them. You will see how your obstinacy will not save your Motherland from downfall, souls from corruption, or churches from abuse. You will gnash your teeth in powerlessness and slowly grow feeble. And if you openly resist, then you will be killed in a basement and buried, unrecognized, in some unmarked pit. No one in Russia escaped this trial; this test overtook every man: from the Tsar to the soldier, from the Most Holy Patriarch to the last atheist, from the rich to the destitute. And each was put to an unprecedented test- to stand before the face of God and testify: either by the word, which became equivalent to the deed, or by the deed, which became equivalent to death. The ordeal was fiery and deep, for what began and took place- and what still takes place- is not based upon party or class, or even the whole people, but is an inquiry of man across the world, a spiritual division, a religious selection, a religious differentiation of humanity. This differentiation is still far from finished, and it has only just begun; Europe, already associated with it, will sooner or later see it roaring through her own depths. The twentieth century has only just begun its business of purification and settling accounts. In this religious trial, taking the form of a world cataclysm, the victor will be neither the man who seizes power for a time somewhere, nor he who occupies some territory; for power can expose, can compromise and ruin an invader. And the occupation of territory can turn out to be fatal for the occupier. But the one who resists, who has already withstood the storm; that endured the trial and remained loyal; who found within himself love and the force of love for his choice; that found within himself a word equivalent to action, and committed an action equivalent to the resolve to die.
. . . the victor is he who rose against: rose against seduction, not falling to it, and rose against terror, not taking fright. It is he who in that terrible moment of choosing, that moment of great solitude- when no one will decide for you, and no one will notice when another’s advice is of no help- in that moment of great solitude, when man stands, longing- choosing between a shameful life and an honorable death; when man inquires into his own last darkness and depth- and instinct begs for life, even a shameful one, and the spirit demands loyalty, even in death; so the victor is he who in this moment of solitude before the face of God would not accept the dishonor of life. He triumphs who agrees to lose everything to save something of God’s. How many similarities between Russia and the South after their great wars! And while acknowledging that events in the South never got quite so bad as they did in Russia, the essential character, however, of the ongoing spiritual battle here is the same as it was there: one of spiritual seduction and religious inquiry. Will we serve God or the world? Will we struggle to live a truly Christian life of self-emptying humility, or will we live selfishly and comfortably? Will we be faithful to the secular trinity of the corporation, government, and entertainment (others could be used here - e.g., science, industry, and technology), or face mockery or worse for true worship of the Christian Trinity of the Father, Son, and Holy Spirit? The way events are progressing, Mr Ilyin’s warning of a ‘religious trial’ for Western man may well be on the way, and not without martyrs and confessors. But whether in severe trials of that sort or simply in the soft seduction of a life of compromise, comfort, and ease, the ultimate victory of the South and other Western nations will be in faithfulness to God. This is how Russia ultimately triumphed. After decades of suffering under the brutal atheistic materialism of the Soviets, the Russian people, through their repentance and through the prayers of the tens of millions of her New Martyrs and Confessors, began to be renewed, to return to the Orthodox Faith they had spurned. And because of their sincere repentance the Lord granted them freedom from their oppressors without their having to raise another army of men or similar actions. One of the most genuine and spiritually significant victories accomplished in the history of man is the triumph of the Russian White Army. If we can take everything from this victory that was laid into it, then Russia will soon be reborn in power and glory and evince still unseen greatness. And this greatness will be a living edification and support for the rebirth of other nations. "This great saint was bishop in Magnesia, and suffered for Christ at the age of 113. When a violent persecution broke out under the Emperor Septimus Severus, the aged Charalampus did not hide from his persecutors, but freely and openly preached the Christian faith. He endured all tortures as though not in the body, and when they flayed the living flesh from him, the godly saint said to the Emperor's soldiers: 'Thank you, my brethren, for scraping off the old body and renewing my soul for new and eternal life.' He performed many wonders and brought many to the Faith. Even the Emperor's daughter, Gallina, repudiated the paganism of her father and became a Christian. Condemned to death and led to the place of execution, St Charalampus raised his arms to heaven and prayed for all men, that God would give them bodily health and salvation of soul, and that He would grant them the fruits of the earth in abundance: 'Lord, Thou knowest that men are flesh and blood; forgive them their sins and pour out Thy blessing on all.' After praying thus, the saintly elder gave his soul to God before the executioner had laid his sword to his neck. He suffered in 202. Gallina took his body and buried it." (Prologue) . . . Through the prayers and help of the Most Pure Mother of God, of the saints of our Southern forefathers in the British and Irish Islands, Africa, and elsewhere, and of all the New Martyrs and Confessors of Russia, Lord have mercy on us sinners in the South! Industrial Pride or Agrarian Humility?